Minato Sahashi is extremely intelligent, yet due to his inability to cope under pressure has failed the college entrance exam twice. As a result he has been branded an idiot and loser by many. One day after talking to his yet again disappointed mother he comes into contact with a girl named Musubi who was under attack. The girl runs but takes him with her and soon finds that Minato, while unknown to him, is an Ashikabi, one of the mysterious set of masters that have the genetic trait that can become partners with some of the 108 cute girls, buxom women, and bishounen called "Sekirei." The reason for the partnership allows the Sekirei to use all their power to win in the competition held by the mysterious MBI corporation. 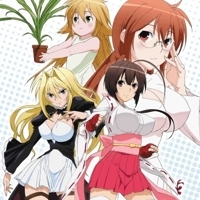 2087 users rated Sekirei [TV].